Microsoft Bing Search Engine by default blocks certain content which is not family friendly. If you are not happy with this default SafeSearch filter, you can disable it. By disabling this, you will not have issues with accessing any type of content on your computer. This tutorial explains the steps to disable SafeSearch feature on Bing Search Engine. See the image below, to understand the warning listed if you have searched for a content that is filtered previously. You can go to Bing Search settings page by visiting the link below. Depends on your needs, you can select the right SafeSearch option from the list. Here you can see three choices. If you select the Strict option in SafeSearch, Bing will no longer show any unwanted content. If you want to enable parental control for results, you must select the option Strict. The second option, moderate also works like Strict option but if you have enabled the moderate option, unwanted text content will be shown. However, unwanted pictures and videos will not be shown when you choose the moderate option. The third option is to completely turn off Bing SafeSearch. With Off option, it will no longer protect you from showing unwanted results. This is another method to bypass the SafeSearch feature set for your country. As we know, some countries are more strict about the content shown on Search results. Those countries implement strict content censoring but some countries have flexible views. So by changing the default country settings to a more liberal country, we can bypass the harsh content filtering in Bing Search. 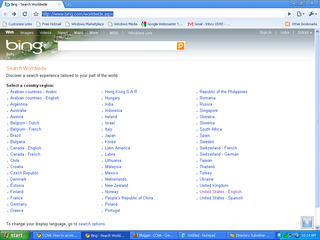 The Microsoft Search Engine is working with full functionality in countries like the United States of America. Most other countries have certain limitations in features or search capability. To get the maximum search feature and avoid Bing safe search feature, we need to configure it with following settings. To enable these two conditions, follow the steps below. You can select any liberal country from the list. If your search Result is blocked by SafeSearch feature, you can turn off it from the same page itself. Be aware that even in the good old USofA the instructions to turn off the safe search feature usually fails.